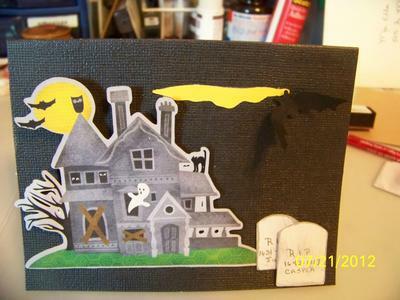 I have lots of Grandchildren to make Halloween cards for, so I start early! I have pics of 2 cards so you can see how the background makes a big difference in how the card looks. To make the card, I used a standard 4.25 x 5.5" card - one orange, one black. 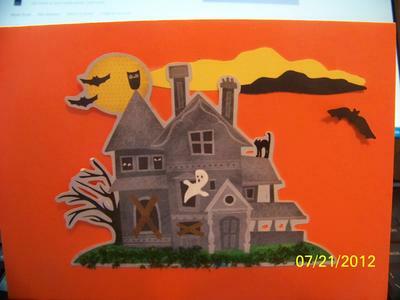 The house with the ghost and moon was cut with my Cricut using the Best of 2008 cartridge, and placed on the card using foam dots, after I curled the tree slightly, to make it more 3D looking. On the orange card I used Flower Soft on the grass. The clouds and Bats were cut from my Cuttlebug using a standard die cut. I glued the clouds to the card and used foam dots on the bats, bending the wings up a little to look like the bat is flying. On the black card I cut out 2 headstones by hand (as I didn't see one on my cricut) and wrote the RIP and Casper (yes the ghost) , and used foam dots on the top one. Very easy card to make! Both of these cards are very very effective .... My favorite one is the orange card and I am sure that your grandchildren will be delighted with them. Halloween is a time of year that children love though you seem to make a lot more of it than we do here in the UK. Maybe we will catch on eventually and celebrate the event with as much fun as the USA. Comments for Halloween is coming!